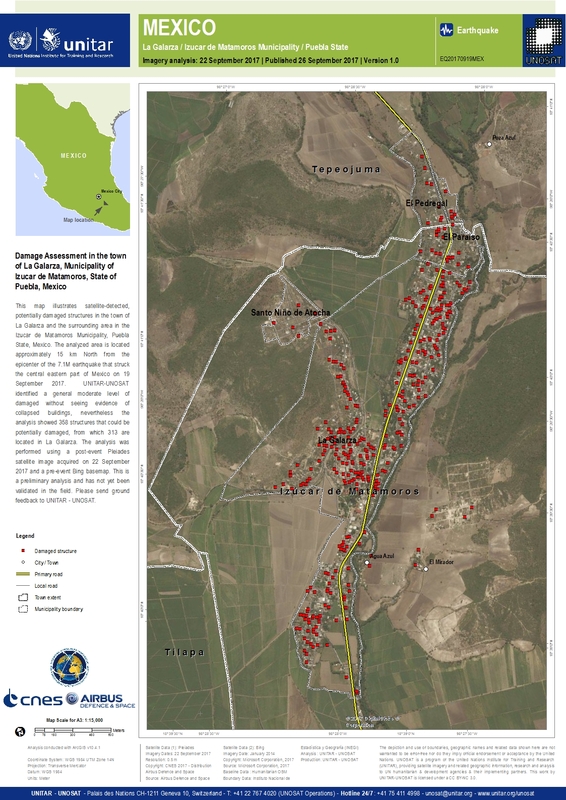 This map illustrates satellite-detected, potentially damaged structures in the town of La Galarza and the surrounding area in the Izucar de Matamoros Municipality, Puebla State, Mexico. The analyzed area is located approximately 15 km North from the epicenter of the 7.1M earthquake that struck the central eastern part of Mexico on 19 September 2017. UNITAR-UNOSAT identified a general moderate level of damaged without seeing evidence of collapsed buildings, nevertheless the analysis showed 358 structures that could be potentially damaged, from which 313 are located in La Galarza. The analysis was performed using a post-event Pleiades satellite image acquired on 22 September 2017 and a pre-event Bing basemap. This is a preliminary analysis and has not yet been validated in the field. Please send ground feedback to UNITAR - UNOSAT.